There has certainly been an IPad explosion related to individuals with autism, Asperger’s and similar learning needs. An IPad is not the only option to provide some important learning opportunities for our kids. I’ve received a lot of correspondence from people who want access to academic games for the IPad. Reading, spelling, math. Well . . . those are available for an IPad, but if that is what you really are interested in, check out the LeapFrog LeapPad Explorer Learning Tablet. The LeapPad Explorer Learning Tablet gives you access to more than 100 educational books, games, videos, and apps. Subjects like mathematics, reading, science, spelling, phonics, music and more are covered in a fun and interactive way. Some activities are on the tablet when it is purchased. Others can be purchased and/or downloaded later, just like APPS for the IPad. The LeapPad Tablet has a great 5″ screen. It’s large and bright. This is a much larger screen than many of the other “child” electronics. The screen resolution is much higher, too, which means the picture quality is considerably better than a lot of other options. The LeapPad Tablet has a touch screen that works basically like the IPad. The LeapPad Tablet comes with a camera, video recorder and microphone. It can take 30,000 pictures and record 120 minutes of video. That’s a lot of capacity. The LeapPad automatically adjusts learning so that kids can learn at their own pace. They can practice writing with an included child-sized stylus. Kids can read e-books, play learning games, enhance art and animation skills, listen to and play music, learn writing, watch videos, and do flash cards and lots more. MOST IMPORTANT. The price of the LeapPad Tablet is under $100. Much cheaper than the IPad. Additional APPS are available for purchase just like the APPS for the IPad. You are able to choose which ones are most appropriate for the individual child the device is purchased for. 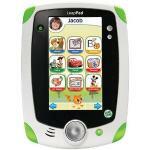 The LeapPad Explorer Learning Tablet is a very child friendly alternative to the IPad. It offers a lot of educational activities in a format that is highly desirable from a child’s point of view. We have already established that our students on the Autism Spectrum are drawn to visual learning. This LeapPad Tabletmeets a lot of educational needs at a price point that is considerably lower that the IPad. Just keep in mind that LeapPad Explorer Learning Tablet is NOT an IPad. It will not work with some of the specific communication APPS like Proloquo2go that have been developed for the IPad. But if you are looking for a less expensive, child friendly, child durable option that will help teach “basic skills” then theLeapPad Tablet might be a great option. The LeapPad Tablet was one of the HOT items during the holiday season. (Don’t tell anyone that I stood in a pretty long line to get the one for Bella!) The good news is that now that the holiday rush is over, they are back again. Definitely worth checking out.